Prominent & Leading Manufacturer from Ahmedabad, we offer ghee clarifier. Being the leaders in the industry, we offer Dairy Machines and Ghee Clarifies to our highly valued clients. This clarifies is available with a cast iron frame, worm gear, bowl hood and disc all that are made up of high grade stainless steel. It is capable to produce 1000, 2000 and 3000 liters of pure ghee per hour and is highly appreciated for its corrosion resistance, durability and long functioning life. In addition to this, it is provided with a standard tools and spare parts as the accessories. Available in 1000, 2000 and 3000 Lit/Hour. Working Principle : Ghee from the settling tank is fed through the inlet placed at the top of ghee clarifier. Separation of the ghee residue from the ghee takes place in a solid wall bowl, under the influence of centrifugal force. The residue, thus separated is collected in the sludge space of the bowl and clarified ghee flows through the clarifier outlet. Ghee Clarifier comprises a cast -iron frame with the drive housed in its lower part. The bowl is fixed on the top of the spindle. The worm gear is placed in oil bath. All parts coming contact with ghee distributor. Bowls body, bowl hood, discs, etc are made from stainless steel 304. The cast- iron frame is painted in Blue color. 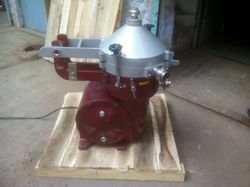 The Ghee Clarifier is supplied with a set of standard tools and spare-parts. Looking for Ghee Making Equipments ?